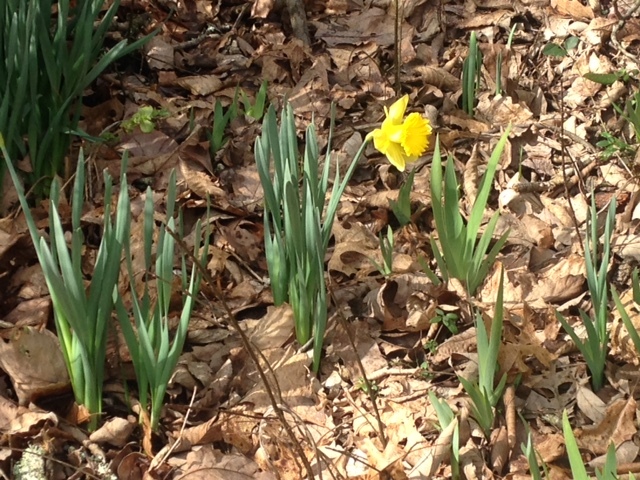 What is this daffodil thinking? It’s February! Tennessee’s weather is predictably unpredictable–even in winter. It’s not unusual for a warm spell to take a peek from behind the curtain for a few days. The warmth is both a tease and a promise. The tease is we want to stow away our coats and mittens, but the warm wether won’t last. We’re bound to have another strong cold snap within the next few weeks. The promise is spring is coming, and that gives us hope in the midst of a frosty forecast. If you’re going through a difficult time right now take heart–it’s a season, it’s not permanent. With God’s help you can overcome every circumstance. An athlete crippled in a car wreck becomes an Olympic champion in the Paralympics. A drug-addicted mother overcomes the addiction and becomes a mentor for other addicts. A murderer in prison for life becomes a Bible teacher and brings hope to his inmates. An abused woman forgives her abuser and leads him to the Lord. Maybe that daffodil isn’t so crazy after all. After the flood, God made a promise to Noah–and to us: “As long as the earth endures, seedtime and harvest, cold and heat, summer and winter, day and night will never cease” Genesis 8:22. In other words, as long as the earth endures we will always experience winters in our lives. To believe otherwise is to live in a fantasy world. The good news is spring is ALWAYS right around the corner.